Last weekend we invited some friends over, as they are having major work done and we thought they didn’t have a kitchen. It turns out that they do in fact have a very functional temporary kitchen, but it would have been churlish to withdraw the invitation. And anyway, it’s always lovely to have an excuse to cook up the works on a Sunday. I have nearly finished reading Julia Child’s My Life in France – in which she explains how she went from no interest in cooking to moving to France with her husband who worked for the US government. Once the she noticed how great food could be. She ended up writing a magnificent opus on French cuisine for the American market in the 1960s and 70s and starring in her own television show, The French Chef. And her descriptions of the food have had me drooling. So I tried not to go and buy her book, Mastering the Art of French Cooking, and on several occasions I have managed not to buy it. But there I was in Daunt Books in Hampstead, flicking through it yet again, and I know I already have a lot of cook books, but this time I just had to buy it. And I’m already glad I did – her coq au vin was totally delicious. It was time consuming, but lends itself to being made a day ahead. The chicken melted in the mouth and the sauce was really rich and sumptuous, with shallots cooked in butter and then a glass or so of wine for an hour, before being added to the meat. Missy B raised an approving eyebrow when she watched me add a glass of cognac and set fire to it. Not just for crowd-pleasing purposes, I’m sure it added to the overall feeling of an extravagant flavour-fest. Julia says you don’t need any vegetables apart from potatoes, but if you must you could serve some peas. And Mr B agreed with her. But my favourite peas are French-style peas, cooked slowly with some shredded lettuce, spring onions, carrots and butter, and I was in charge, so we had those, and some mashed potatoes. I loved it and it seemed to go down very well with the guests, grown ups and children alike. 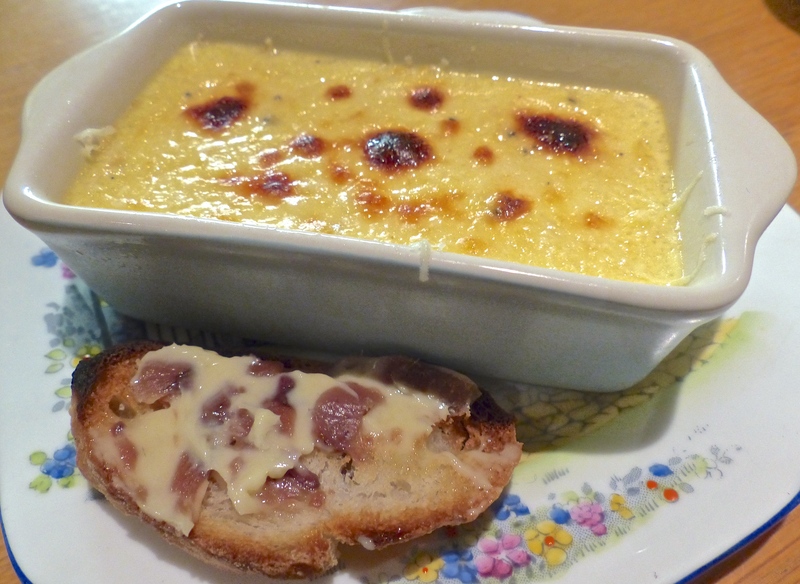 To start we had these little parmesan custards, anchovy toasts – very lovely indeed. And by popular request from the Battenburg family, a good old-fashioned steamed syrup pud to finish. Followed by a bit of a walk in the woods. Thank goodness the end of winter is in sight! Ah thank you – I had a session with my friend from the blogging course who gave me some great tips. Thanks Vicky! Looks delicious, I’ve been thinking a lot about those shallots!